The seventh edition of the Moscow Biennale of Contemporary Art opened last week under the direction of the Japanese curatorial star Yuko Hasegawa, whose selection happened to coincide with a warming in Russo-Japanese relations. But the presence of a Japanese curator at the Biennale’s main exhibition was perhaps the only openly political component of the show at the New Tretyakov on Krymsky Val. 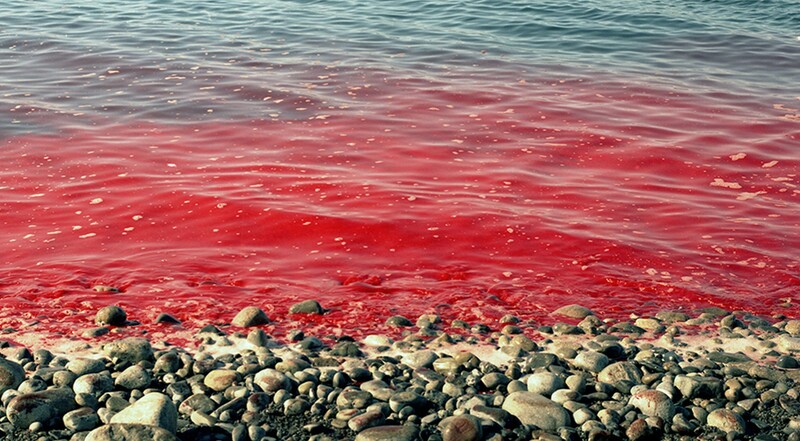 Hasegawa’s attention is focused not on daily crises, but on the creeping calamity of the “anthropocene”, the geological epoch marked by human activity on the planet. Critics immediately accused the curator of taking an excessively conservative and overly sophisticated approach, comparing the exhibit to a Japanese rock garden; the Russian conceptual artist Yuri Albert caustically likened it to a biological museum. In fact, the accusations of conservatism are out of place: Hasegawa’s project is, if anything, futuristic, concerned with imagining an ecosystem of the time to come. 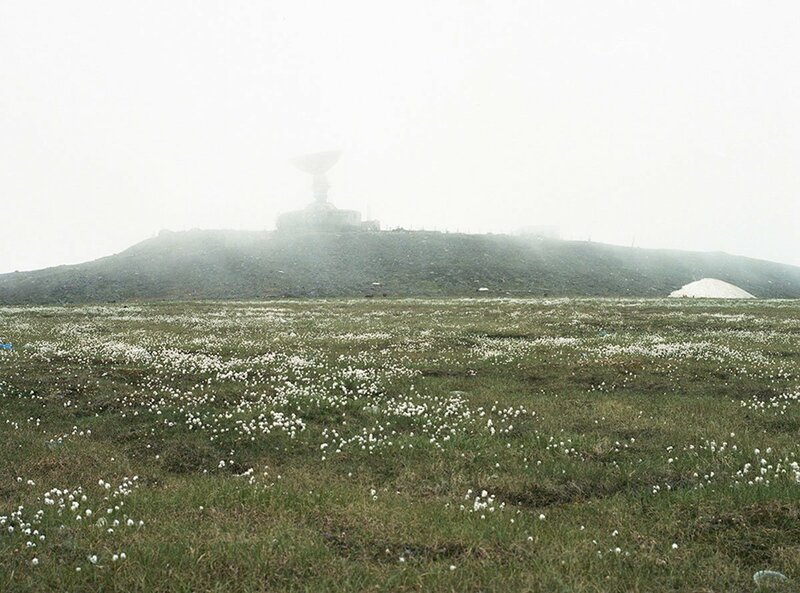 Hasegawa uses the term “New Order” to describe a system that contains micro- and macro-climates, humans, plants and animals, as well as mountains of data, information and matter. Her system supposes a dichotomy, but instead of hell and heaven, or good and evil, she proposes the categories “Forest” and “Clouds”. 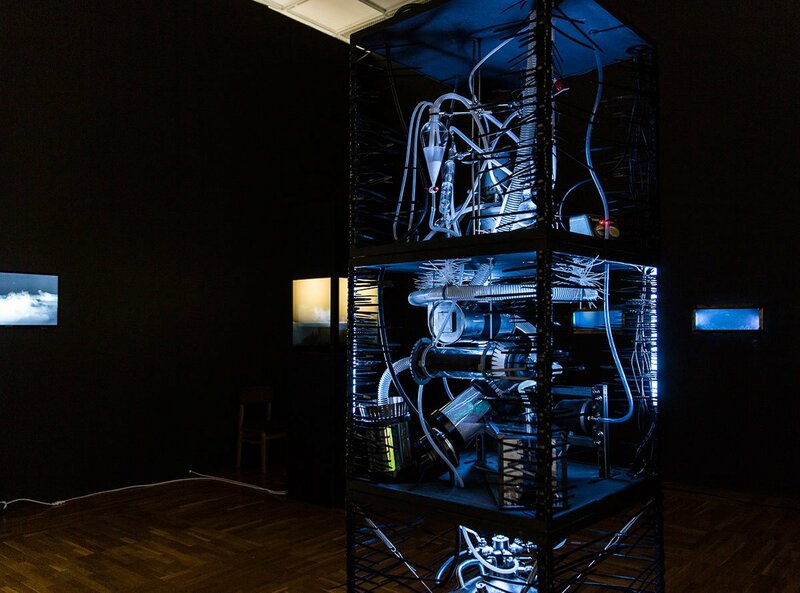 This posthumanistic construction does away with old ethical principles, and in turn proposes a new basis for aesthetics: one based around both the digital cloud and the figure of the dark, mutating forest. This new system of values is outlined in the philosophy known as Dark Ecology, which acknowledges the existience of — and need to coexist with — a world that is irreparably contaminated. The Biennale begins in a series of small room with high-contrast lighting. 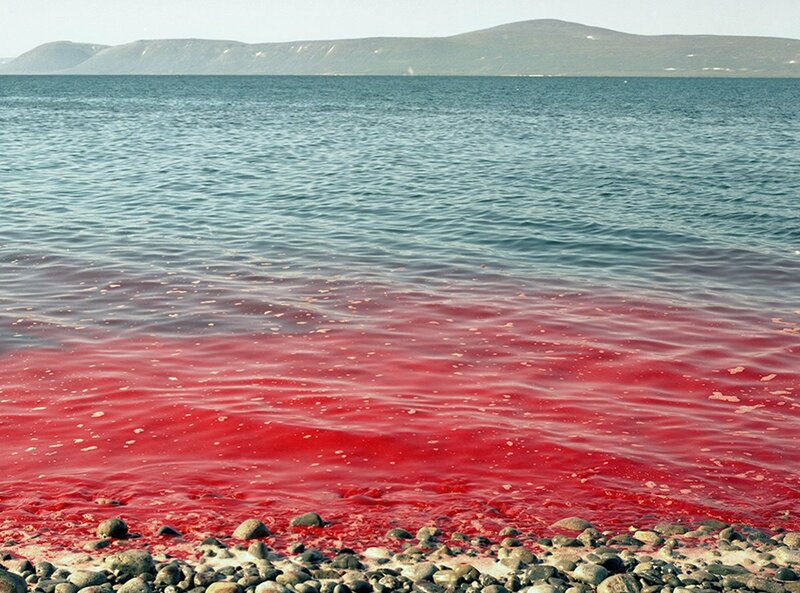 The beginning of the exhibition is focused on the theme of unavoidable catastrophes: informational and radioactive pollution, the tragic melting of the icebergs and, if the apocalypse comes, the emergence of new, autonomous ecosystems. The only thing saving the viewer from a Von Trierian melancholia is the narrow labyrinth of exhibition spaces, which force one to keep moving. The show moves fluidly from the macro-cosmos to the micro-cosmos. The culmination of the exhibition features a personal drama, a breakup — namely that of Icelandic singer Björk and artist Matthew Barney. 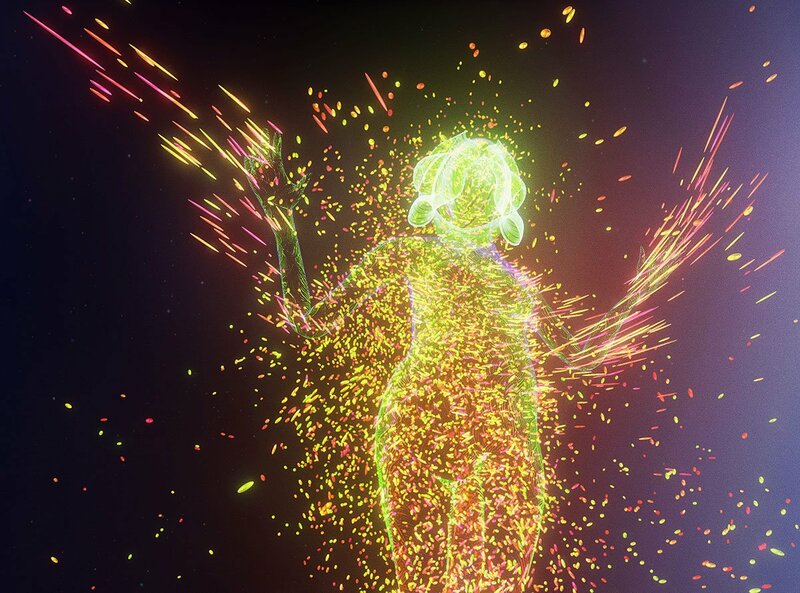 Björk offers a healing balm in the form of a virtual reality installation built around her music. Inside her digital world, awareness of the self and the outer world become one. Yet, as with any therapy, be it psychoanalysis or an art residency, the effect is limited. The true children of Saturn, those inclined by nature toward melancholy, know that this illness is incurable, just like our planet. 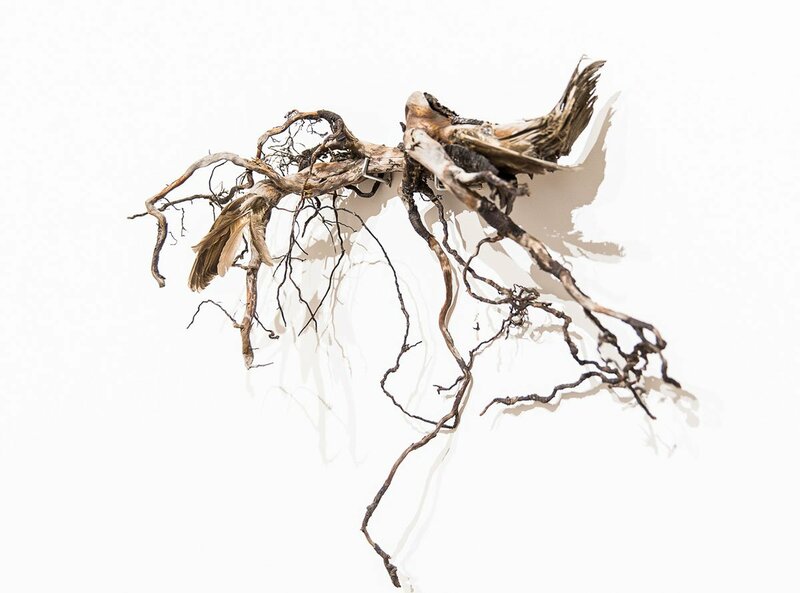 The French artist Mary-Luce Nadal (born 1984, Paris) is a master of natural elements. 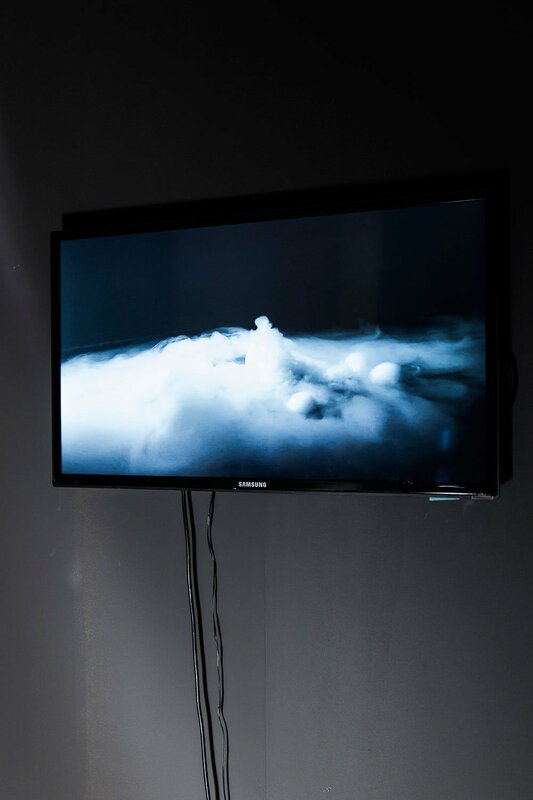 Her project, Cloud Factory, has been exhibited multiple times in major European museums. She engages in the demiurgic exercise of manipulating nature, of birthing clouds. A series of complex machines stand in glass boxes throughout the room, resembling the stage design models encased in glass boxes at the Palais Garnier in Paris, especially those created for Richard Wagner. Before creating a cloud, Nadal cleanses the water and the air. Then she keeps her cloud-pets in aquariums, displaying them like fish or turtles. Sometimes she makes them cry. Viewers can look on longingly as the raindrop-tears fall. Revital Cohen and Tuur van Balen are a group of young artists from the UK working at the intersection of design, art and science. Their sphere of interests ranges from science to politics, from poetry to society. 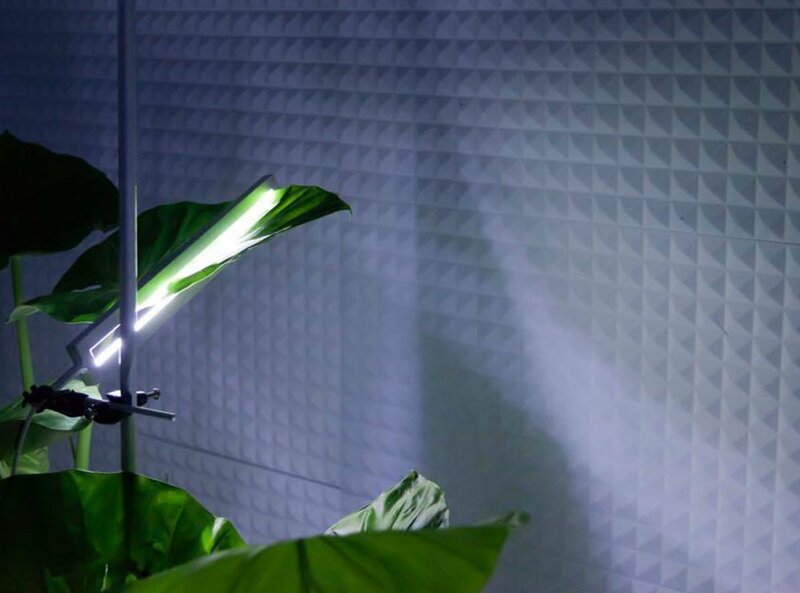 Their installation The Quiet (2015) features a dark, sound-isolated room filled with living plants. 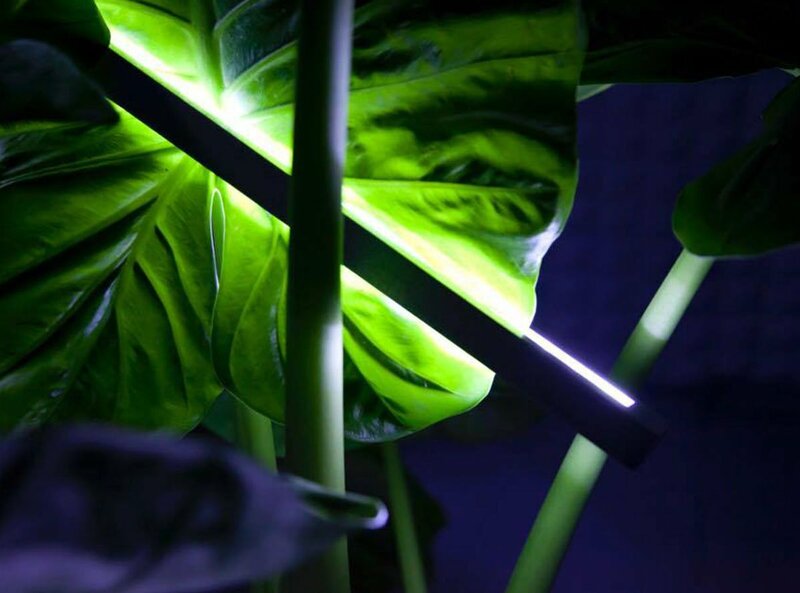 In the dark, the plants breathe and their leaves are partly lit from below. These plants give off oxygen, creating an atmosphere akin to a sweltering tropical jungle before a storm. 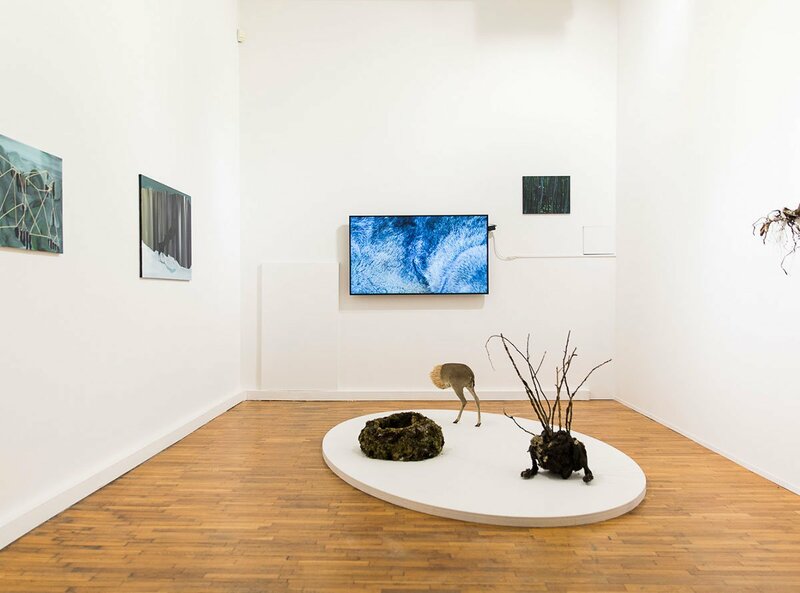 The room becomes a metaphor for the ability of living creatures to anticipate impending natural crises, for the plants to sense the coming planetary catastrophe. The artists, in turn, emerge as masters of the aesthetics of the invisible and the uncanny. Kanako Azuma of Tokyo works with a range of media, including video, photography and performance. Azuma is distinguished by her lack of ideological markers and a sense of interminable sadness and worry. She works in a space absent of conflict and aggression. Her video, Eternal Lovers, is poetic and perverse, depicting the love between a scientist and the orchids he has raised. 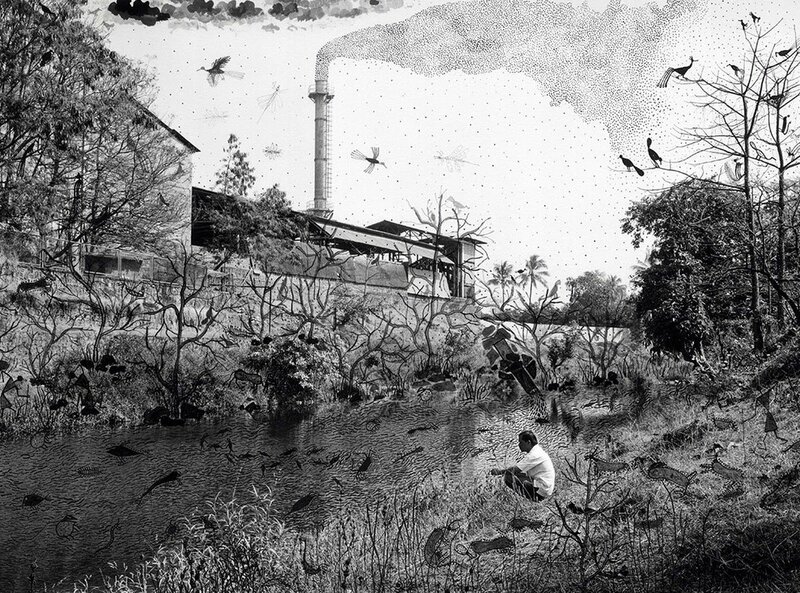 Azuma recreates the cold atmosphere of the laboratory in a style similar to the films of the German video-artist Harun Farocki. In place of a critique of contemporary society, we find a new dynamic, where the plants attempt to thank those who care for them. Pierre Huyghe (born 1962, Paris and New York) is one of the undisputed stars of the seventh Moscow Biennale, an international prize-winner who has also been featured in Venice. Huyghe, the Jan Fabre of French video art, brought his piece Human Mask, a series of photographs presented as projections along the wall. 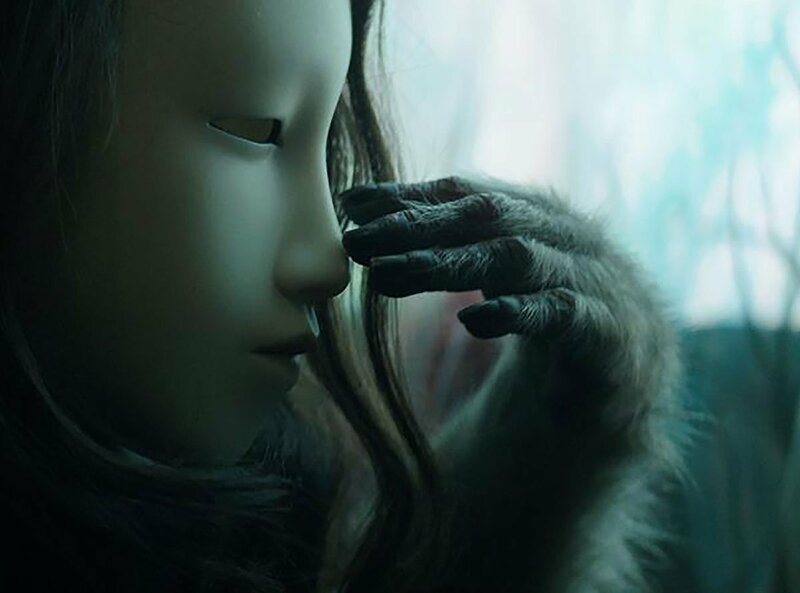 An ape dons the mask of a young Asian girl, akin to a character from a horror film. The mask becomes an anthropomorphic animal, bringing up an unexpected mix of emotions: a parental tenderness and concern mixed with horror and disgust. This manipulation of the viewer’s emotions is a form of irony regarding the search for an animal soul, and perhaps an authorial interpretation of the internal world of man. Natalia Bazowska is a Polish artist who grew up in the mountains, surrounded by wilderness. She studied both art and medicine, completing a dissertation in psychiatry. 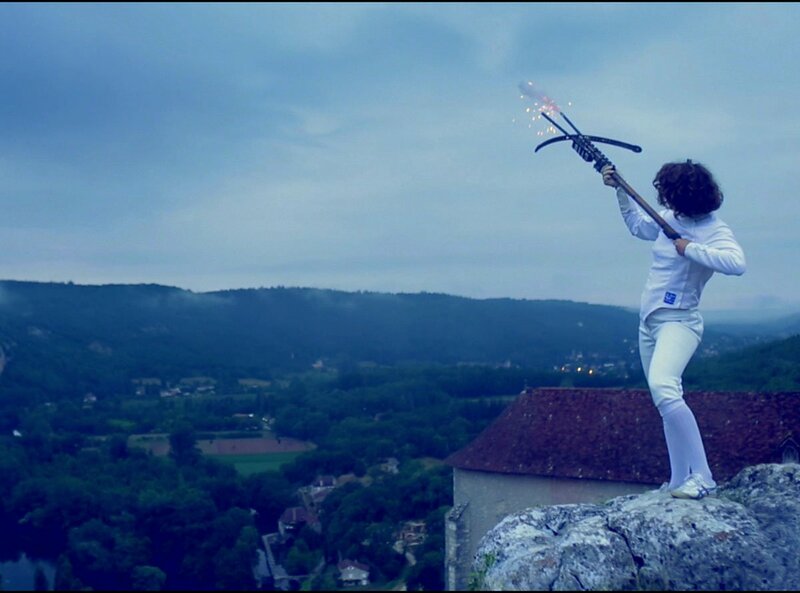 Bazowska combines different media, including painting, video, performance and installation. 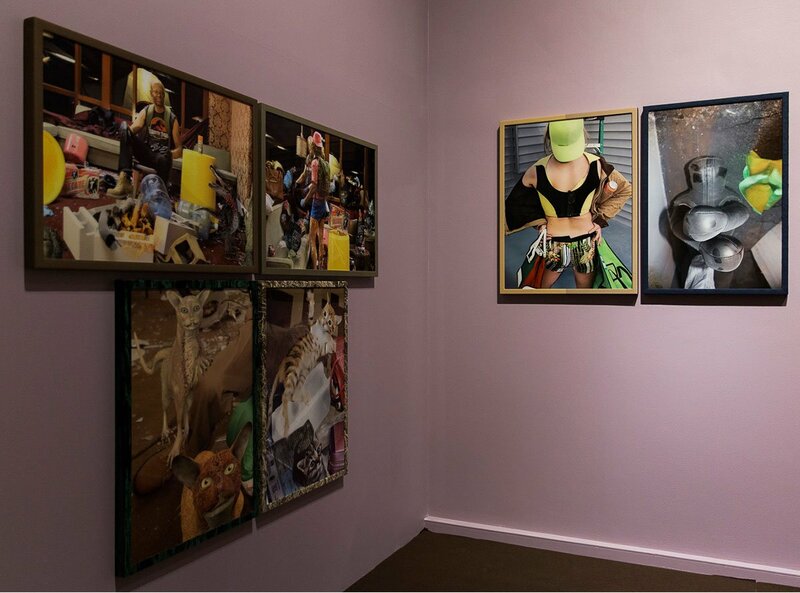 For her project at the Biennale, she fills a small room with strange objects and paintings. The artist is concerned primarily with the study of the soul of people, animals and plants. The objects — strange assemblages of moss, toothpicks and taxidermy — stand amidst a series of acrylic paintings. These canvases feature Bazowska’s protagonist: a black female figure, observing the sublime, as reflected in an abstract green background. The Russian artist Ilya Fedotov-Fedorov continues his series of projects in the style of “art as interdisciplinary research”. 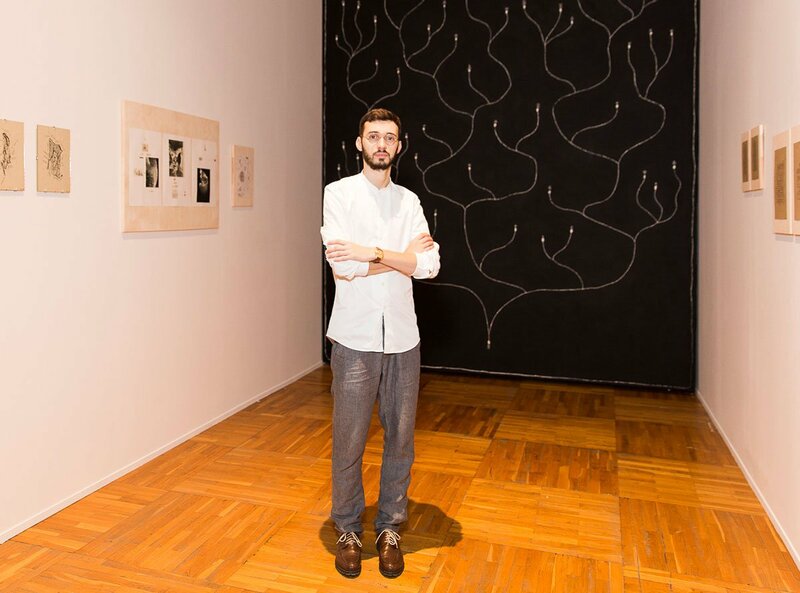 Originally a geneticist by training, he has become a favourite of the Moscow art scene this year. His project here has none of the herbariums and stuffed animals that Moscow art-lovers have come to expect from him. Instead, the artist turns to study the syntax of biological systems, presenting varied models of development, growth and interplay. 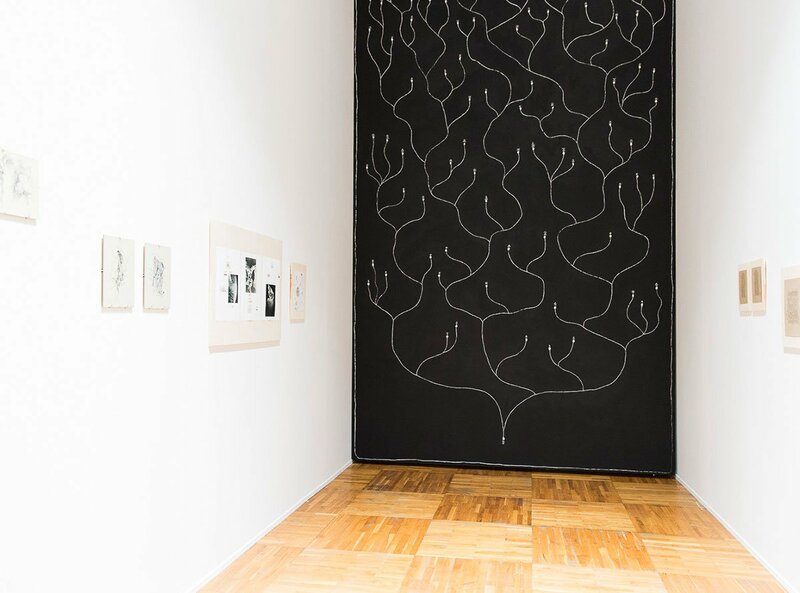 The main piece is a blackboard, five by three metres, on which he has scratched a rhizome reminiscent of a genealogical tree, or the Chinese book of changes, I Ching. This monumental piece is surrounded by several small graphic works, including a painting of cell structures drawn with tea on watercolor paper. 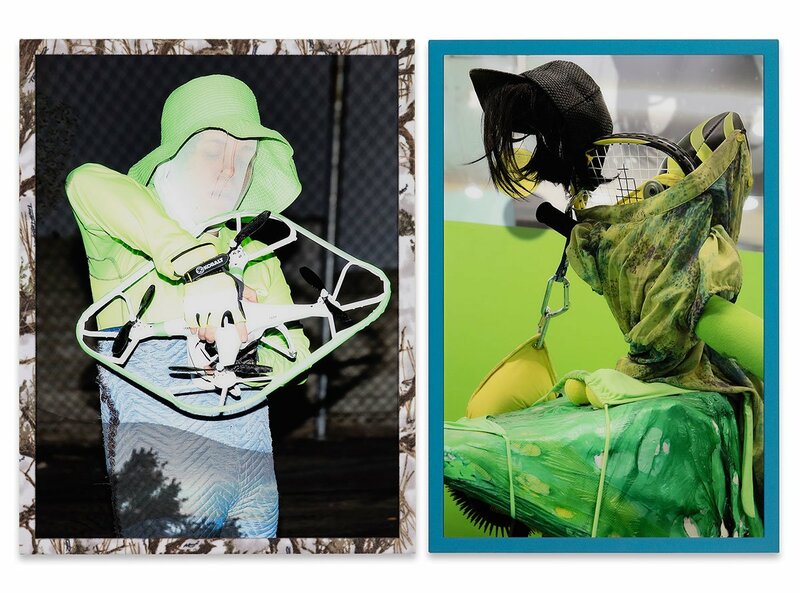 Ryan Trecartin, a queer American artist, is a bright example of the “Dark Ecologists”. He brings a set of videos and stills printed on photopaper, all run through with a shade of toxic neon green that David Burliuk would have appreciated. Trecartin’s neologisms and his hybrid language would also have moved the Russian avant-gardists whose works fill the neighbouring halls of the New Tretyakov Gallery. In the room with Trecartin’s videos stand a set of tables and chairs, seemingly inviting the people of the future into dialogue with the author, or with each other. Perhaps not incidentally, these spaces are almost always empty. Sissel Tolaas is at once an artist, chemist, mathematician and linguist. Her work on smell has been recognised by leading world universities, from Stanford to Singapore. Her project at the Biennale, an exploration of scent and memory, falls in the great tradition of dandyism, à la Joris-Karl Huysmans, Oscar Wilde and Patrick Süskind. Such work with smells is rare in today’s contemporary art. 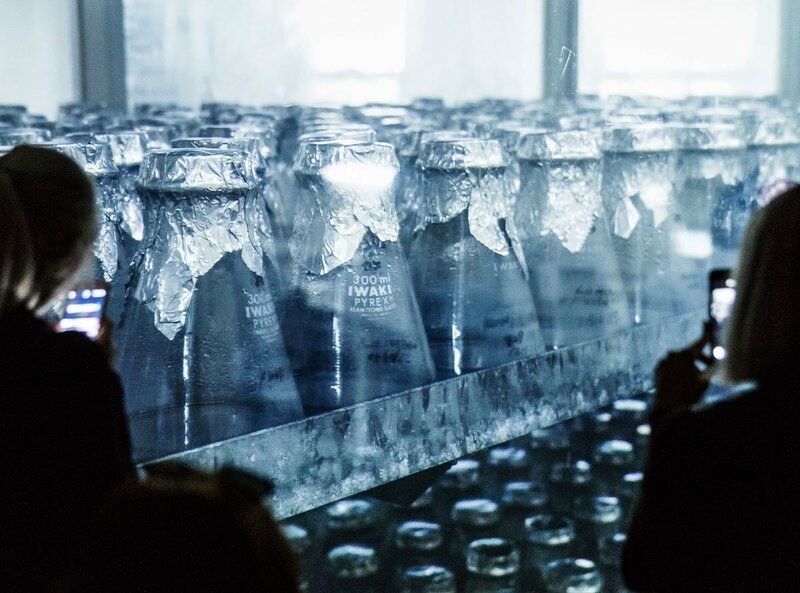 But in Moscow, it’s the second such major project to play with scents this year, following Irina Korina’s total installation at the Garage Museum Triennale earlier this spring. Tolaas’s concept is a memory game. Instead of images, the player is asked to remember smells and find their pairs. For the Russian context, Tolaas created a set of scents connected to the cosmos. 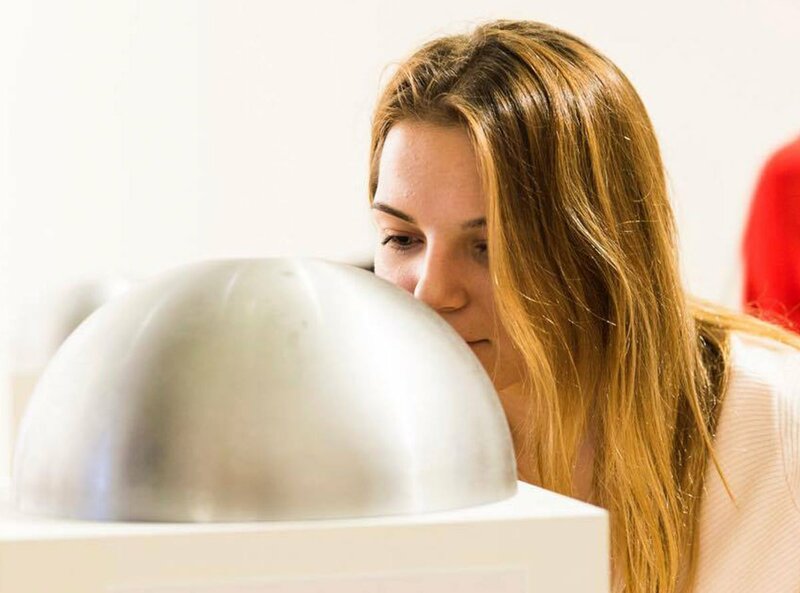 Her project leaves no doubt that she is a world leader in the study of smells and their influence on our cognitive processes. Since 2013, the Indian photographer Gauri Gill and the artist Rajesh Vangad have been collaborating to document life in an Adivasi village on the coast of Maharashtra. Gill is well known for her use of photography as a memory practice. Here, she speaks of her camera “capturing the distinct chameleon-like skin of the landscape”. Vangad then inscribes the photographs with drawings that peel that skin away, revealing a truth beneath what is visible to the naked eye. The drawings resemble hieroglyphics, or ancient cave drawings and, in their almost primitive sincerity, seem to hint at the inadequacy of modern means of representation. Looking at their collaboration, one has the sensation that the developing fluid revealed not only the imprint of the light on the photo paper, but the invisible ink of the moment’s subconscious. This is not the Icelandic artist’s first appearance in the Moscow Biennale. She took part in the second edition as the hero of the artist Matthew Barney’s six-hour film, Cremaster. One piece of the film was dedicated to the Japanese wedding of Björk and Barney, which saw the lovers transform into whales — a final scene that could have touched even the most marriage-averse person on earth. If Barney was the center of attention in 2007, then in 2017, the star of the biennale is Björk herself. The singer and the artist went through a painful and public breakup. 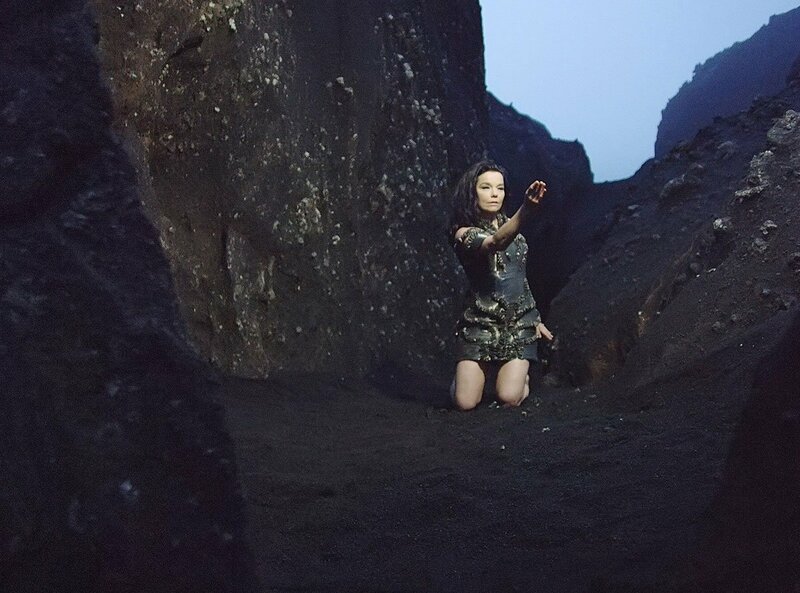 Björk dedicated an entire album to the tragedy, hoping to make up. At the biennale, inside a virtual reality world of her creation, it becomes clear that getting back together again is impossible. Björk instead becomes a digital cloud, and reprises the image of herself as an eternal alien youth that she cultivated in the 90s. The hallucinogenic dreams of VR look so convincing that you begin to believe in art as the truest form of therapy. Incidentally, Barney also makes an appearance in the last room of the biennale, with a series of shining copper plates reminiscent of cheap Chinese souvenirs, engraved with astronomical abstractions. For those who find the main project too distant from direct politics, the Biennale’s parallel program, and especially Gavrilova’s exhibition, returns us to harsh reality. Gavrilova is a graduate of Moscow State University’s geography department. While defending her dissertation, Gavrilova also studied at Moscow’s Rodchenko School of contemporary art. Gavrilova is now working on a PhD in cultural geography at Oxford University, in parallel to her artistic practice. Her exhibit Not a Mainland is based on materials from a recent trip to Chukhotka, in Russia’s far east. Photographs from the expedition serve as dark evidence of the mistakes of collectivisation. The Soviets saw collectivisation as a blessing not only for Russian peasants, but for the indigenous peoples living across the territory of the USSR. In reality, for the native peoples of Chukhotka, the destruction of their traditional way of life proved extremely traumatic. More than 100 villages were abandoned in Chukhotka alone. 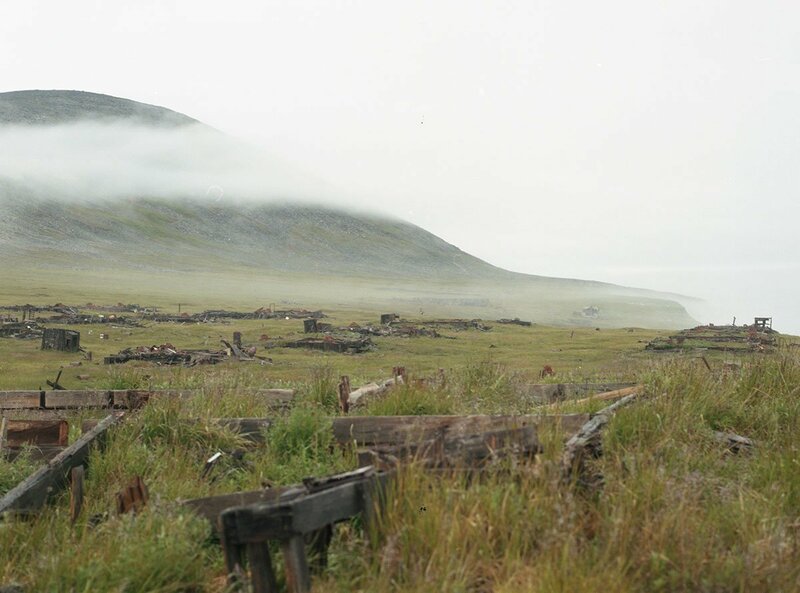 But now, as Gavrilova documents, the Chukchi and the Eskimos have begun returning, just as nature returns to the spaces that humans abandon, erasing, little by little, the traces of civilization.